Flyball is a canine relay race where a team of four dogs must race over a set of four hurdles to a ball box, retrieve a ball and return over the hurdles and pass the start line before the next team dog can run. The match winner is the team who finishes their runs first with no faults, if a dog makes a fault it must run again. Each race is made up of normally 3 matches unless a tiebreaker is needed, but sometimes there are 5. The team who wins the most matches wins the race (so either 2/3 or 3/3). The sport of Flyball started in the 1960’s/1970’s in Southern California and came to the UK in 1990 when a demo was held at the Crufts dog show. After this the Kennel club started running competitions with qualifiers threw out the year to get to the Crufts competition. 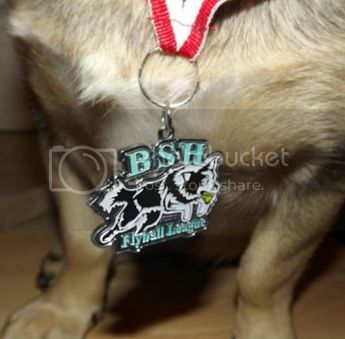 At the same time a separate organisation called the British Flyball Association was formed to be the governing body of International Flyball Racing within the United Kingdom and holds races under their own banner. While both clubs run Flyball races they have do have different rules, the main one being the height of the jumps. Under the KC jumps are set at 13inch high while under the BFA the jumps are set at 4inch under the dog’s height to a minimum height of 8inch. 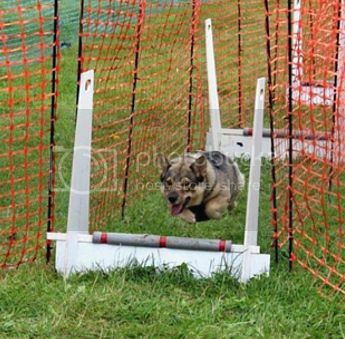 Most Vallhunds compete with BFA teams. 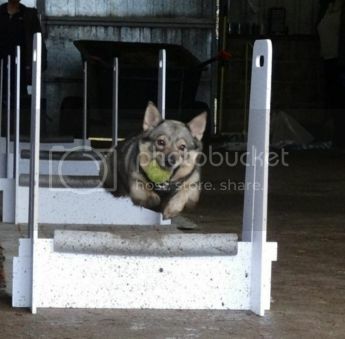 We first got started in Flyball as i was looking for something a bit more fun than showing to do with my girl Fay. We came across an advert for a local team and decided to give it a try. Being quick to learn, eager to please and with her love of tennis balls Fay took to it like a duck to water. Everyone was impressed who fast she progressed through training and that despite her smaller size compared to the larger dogs there she was still quick. It wasn’t long before we attended our first starter’s competition with the team where we did very well, coming in second place and having the fastest run time out of all 12 starter teams that day. We hope to be starting in the full division races very soon. Flyball is a great activity whether you plan to compete of just want to train as it can help keep your dog fit both physically and mentally, does not physically demanding on the owner, good socialisation for both dog and owner and helps build a strong bond with your dog by working together. While young and still growing your dog can work on the basics mainly recall and fetching the ball, then once old enough they can move up to going over the jumps and working the box.